To have “humanity” or be “humane” is supposed to connote positive meanings: caring, compassion, wisdom. But given humanity’s propensity, on both a personal and global level, for cruelty, greed, and selfishness throughout history (latest evidence here), I always thought it was appropriate to switch the meaning. 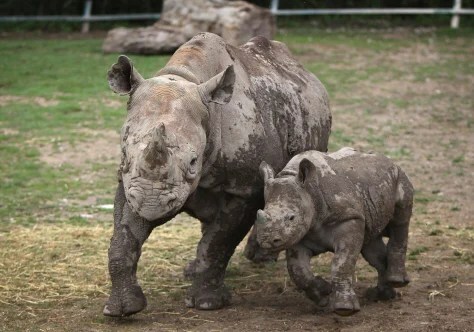 Humanity hasn’t done the black rhino any favors. For now, I will stick with my reversed concept of humanity. But it is in the stories Abani recounts (along with his humor and resilience), and the possibility that they can be contagious, that I place my hopes for the future. There can be no Justice. The deeds have been done, the people have been killed, wounded, scarred. But WE the People can still demonstrate that WE are above the very act we have him on trial for. His one death does not make up for all the lives taken, the suffering caused; Killing him back isn’t Justice. It’s revenge, petty, pure and simple. Is killing okay when WE do it? When YOUR determination is that it is justice? We’re all too cavalier about taking life when it suits us, about defending life (even when it’s just a gelatinous mass called a fetus)when it suits us. Perhaps it is SENTIENCE we should be defending, if we are truly Sapiens ourselves. The man offered life in prison without possibility of parole. That would protect us from any future wrongdoing and save us many millions of dollars. Accept the plea and lets get off of your career-building aspirations and back on to the healing at hand. Such healing is not accomplished by more destruction, but by love and time. I’m quoting the above because it seems, to me, that it’s all the same subject. A long-time friend of mine points out that we shouldn’t expect people to care about non-human earthlings, citing the way we treat each other, our very own species. Perhaps when we raise ourselves up by the bootstraps to become better than we are about ourselves, we’ll be able to do the same for non-human earthlings. My fear is that such enlightenment will arrive far too late.